2019 Silverado launches Chevrolet’s second century of trucks. Yesterday, we looked at the 2018 Chevrolet Silverado in Centennial trim, a model that both marks an important milestone and brings the curtain down on the final model year of the current generation. Later this year, an all-new 2019 Chevy Silverado debuts, a full-size pickup truck that is longer, but lighter than the current one. 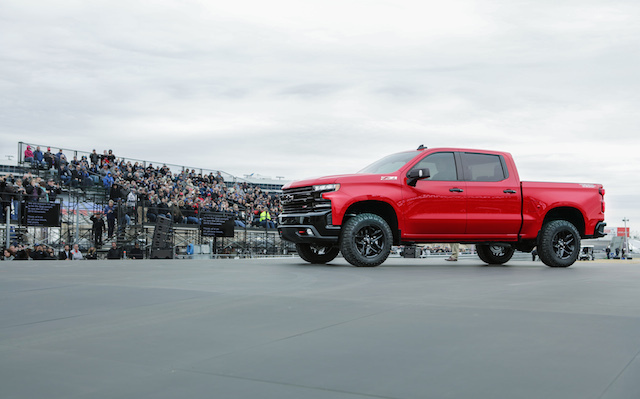 True, the 2019 Silverado’s initial unveiling took place at a special event last month marking the brand’s truck centennial. But the North American International Auto Show (NAIAS) in Detroit was the first major show for the truck’s official appearance. Over last weekend, Chevrolet offered a more comprehensive press conference, outlining most details left unknown in December. Most, but not all. The 2019 Silverado makes an early appearance in Texas last Dec.
1. Eight distinct models. The major manufacturers have long delivered numerous sub-models based on the main truck model. Manufacturers may call them models, but they are in reality grades or trims. No matter, you’ll find no less than eight when the 2019 Silverado rolls out: WT (work truck), Custom, Custom Trailboss, LT, RST, LT Trailboss, LTZ and High Country. Add in three cab sizes — regular, double and crew, short and long box beds, rear- and four-wheel drive, and various package choices, including Z71. 2. Longer and lighter. 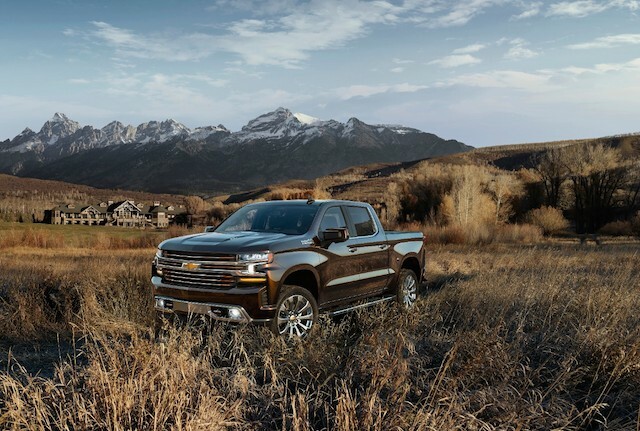 Depending on the model, the 2019 Silverado is up to 3.9 inches longer between the wheels with an overall length that is 1.6 inches longer. Despite the larger footprint, the new model is up to 450 pounds lighter. Chevrolet realized weight savings in several areas thanks to a greater use of mixed materials. For example, all door, hood and tailgate swing panels are aluminum while fixed panels such as the roof, bed and fenders are steel. Furthermore, mixed materials are in the suspension, while higher-strength steels are present elsewhere. 2019 Chevrolet Silverado 1500 Crew Cab. 3. Six engine/transmission combinations. Chevrolet has long offered a family of three gas engines for the Silverado 1500, including one V6 and two V8 engines. Those engines displace at 4.3, 5.3 and 6.2 liters, respectively. For 2019, a 3.0-liter Duramax inline six-cylinder engine becomes available. Both the diesel and the largest V8 work with a 10-speed automatic transmission. Word has it that the 3.6-liter V6 used in other GM products will replace the 4.3 liter. In any case, an eight-speed transmission seems likely with the 10-speed optional. Another powertrain choice may include a hybrid. In any case, GM said six powertrain combinations are in the offing, while leaving some details out. 4. Increased cargo capacity. 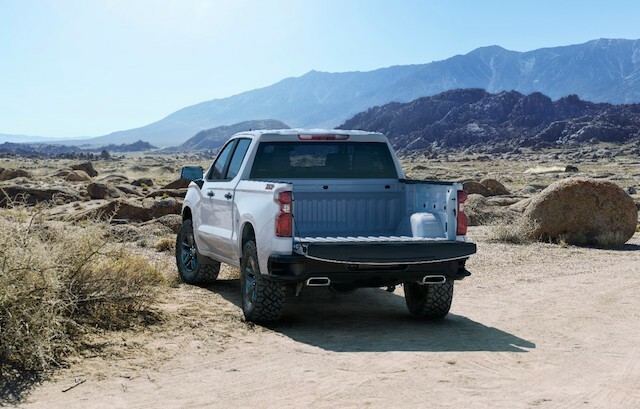 Chevrolet claims the 2019 Silverado beats the competition in the cargo carrying compartment. The short box now offers 63 cubic feet of volume, giving it a 20 percent edge over the nearest competition. Chevrolet increased the volume by widening the maximum width of the truck bed by seven inches. In addition, the truck bed now has 12 fixed tie-downs along with nine moveable tie points. Accessory bins are optional, designed to fit over the wheel wells to deliver seven cubic feet of lockable space. Lastly, a 120-volt outlet and LED Rear Task Lighting are also available. 5. An updated interior. 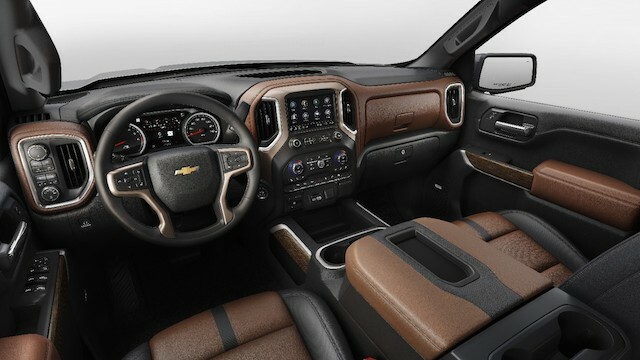 Just as the Silverado benefits from a new exterior, the cabin features a fresh design. Most importantly, the interior is roomier with more rear legroom and additional storage space. Newly available storage features include a pair of 10-liter bins integrated into the second-row seatbacks, ideal for holding gloves or tie-downs. You’ll also find a 24-liter storage tray under the rear seat, suitable for carrying groceries or your outdoor gear. The Silverado’s roomy and in this case, upscale interior. The next-generation Silverado arrives as the segment continues to enjoy modest year-over-year growth in a passenger vehicle market that pulled back slightly in 2017. Even if sales slip below 17 million units in 2018, in all likelihood pickup trucks will command a bigger share of the pie going forward. An all-new Silverado arrives in time to gain a bigger slice of said pie. Photos copyright General Motors Company. All rights reserved.